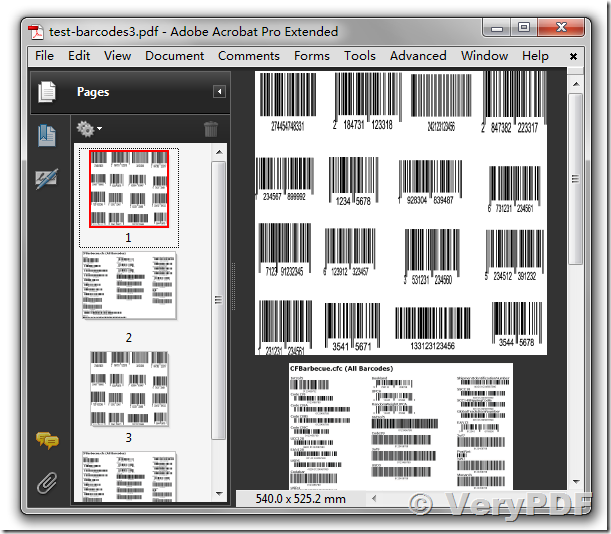 Read barcodes from PDF, TIFF, JPEG images from scanner, fax, camera. Read 1D barcodes (such as Code 39, Code 128, etc.) and 2D barcode: PDF417, DataMatrix, and QR code. Maximize the usability of the barcode data and simplify application development. VeryPDF reader automatically identifies the appropriate data presentation and provides it to the application. Automatically decompresses barcodes from Adobe? LiveCycle? forms. Consolidates multiple 2D barcodes using structured append (including MacroPDF47) (including MacroPDF47) into a single barcode data. Read barcode from images, TIFF and PDF with this freeware application. New barcode types supported: GTIN-8, GTIN-12, ITF-14, Code 93, MSI, GTIN-14. Improved support for barcode reading from noisy images (lot of images works without need to enable noise removal). This entry was posted in Barcode Generator and tagged barcode api, barcode ocr, barcode pdf, barcode reader, barcode recognition, barcode sdk. Bookmark the permalink.